Also called Chinese grapefruit, shaddock, pumelo, pommelo, and pompelmous. 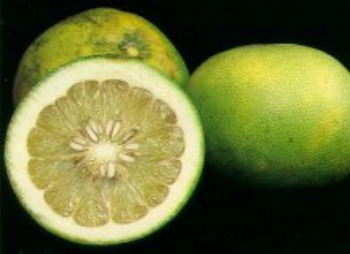 The pomelo is an exotic large citrus fruit that is an ancient ancestor of the common grapefruit. It is the largest of the citrus fruits with a shape that can be fairly round or slightly pointed at one end (the fruit ranges from nearly round to oblate or pear-shaped). The pummelo can range from cantaloupe-size to as large as a 25-pound watermelon and have very thick, soft rind. The skin is green to yellow and slightly bumpy; flesh color ranges from pink to rose. Like grapefruits, pomelo can range from almost seedless to very seedy, from juicy to dry, from sweet to sour. It is sweeter than a grapefruit and can be eaten fresh, although membranes around the segments should be peeled. Pumelos commonly have 16 to 18 segments, compared to most grapefruit that have about 12 segments. Be sure to refrigerate and use quickly. Use as you would grapefruit sections. They are also good for jams, jellies, marmalades and syrups. It is grown in many eastern countries including China, Japan, India, Fiji, Malaysia, and Thailand. It is also now grown in the Caribbean and in the United States, in California and Florida. In season November through March, Pummelos are especially popular for Chinese New Year. The Chinese believe the delectable Pummelo is a sign of prosperity and good fortune – good things will happen if they eat it. The peel is also used in Chinese cooking or candied. In general citrus peel is often used in southern Chinese cuisine for flavoring, especially in sweet soup desserts. One-fourth of a Pummelo (152 grams) has 60 calories and provides 130% of the Vitamin C recommended for the day. It is sodium, fat and cholesterol free and is a source of potassium. The pomelo is native to southeastern Asia and all of Malaysia; grows wild on river banks in the Fiji and Friendly Islands. It may have been introduced into China around 100 B.C. It is much cultivated in southern China (Kwang-tung, Kwangsi and Fukien Provinces) and especially in southern Thailand on the banks to the Tha Chine River; also in Taiwan and southernmost Japan, southern India, Malaya, Indonesia, New Guinea and Tahiti. The pomelo is also called shaddock after an English sea captain, Captain Shaddock, who introduced the seed to the West Indies in the 17th Century from the Malay Archipelago. The seeds produced fruit somewhat smaller than the current grapefruit, more like an orange. The size of the fruit and the fact that it grew in bunches or clusters like grapes prompted a 19th century naturalist to liken the new fruit to grapes, with which it has no botanical relationship whatsoever. Grapefruit can cause serious side effects interacting with certain blood pressure medications. Is the same true for pomelo? Thanks.